ACDelco Cabin Air Filters have advanced filter media technology which helps keep pollutants out of the interior for more comfortable travel. 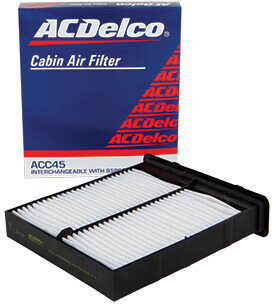 ACDelco Cabin Air Filters help protect vehicle passengers from harmful gases and airborne allergy irritants. All ACDelco Cabin Air Filters also help protect the vehicle’s interior surfaces and trim from airborne dust and dirt. Can remove most allergens from the air entering the vehicle’s ventilation system.